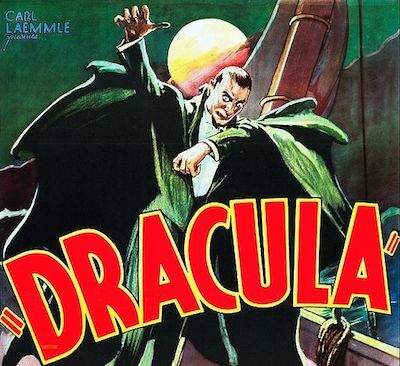 Dracula, directed by Todd Browning, was the first official screen adaptation of Bram Stoker's Victorian Gothic novel. The book had been filmed before, as Nosferatu by FW Murnau, though Murnau's adaptation was unauthorised and its American distribution was legally prevented following a lawsuit by Stoker's widow. Murnau's Nosferatu is one of the masterpieces of Expressionist cinema, though Browning's Dracula pales in comparison. The camerawork is also quite pedestrian, panning slowly away from the action whenever anything horrific happens. Only one sequence demonstrates the skills of cameraman Karl Freund: the fluid camera movement in the establishing shot of the sanitarium, filmed with a dolly and crane. Freund was the cinematographer for several classic German silent films, including Metropolis, The Last Laugh, and Berlin: Symphony Of A Great City; after working on Dracula, he directed Universal's The Mummy. Count Dracula and Frankenstein's monster are the two most iconic characters in horror literature and cinema. Dracula was not marketed as a horror film (hence the odd selection of Swan Lake as its opening-titles music), though it initiated a cycle of Universal horror films that would continue throughout the 1930s. (For a detailed history, see Kevin Brownlow's documentary Universal Horror.) Immediately after Dracula, Universal released James Whale's Frankenstein, Hollywood's first true horror film, a far superior production inspired by German Expressionism. Frankenstein featured two of Dracula's supporting cast, Edward van Sloan and Dwight Frye; Frye also appeared in Whale's The Invisible Man and Bride Of Frankenstein. Dracula may be dead, though Bela Lugosi's performance is too lifeless, with his thick Hungarian accent and odd delivery. Later interpretations, such as Christopher Lee in Hammer's Dracula and even Udo Kier in Andy Warhol's Blood For Dracula, have more vitality and menace. Lugosi and Boris Karloff (Frankenstein's monster) later appeared together in Universal's The Black Cat. Lugosi became a rather tragic figure, playing cameos in Edward D Wood's Glen Or Glenda and Plan Nine From Outer Space. He was portrayed by Martin Landau in Tim Burton's biopic Ed Wood.